Parks’ 3 Tots Gift Sets are perfect for friends, relatives, loved ones, or even as a small well-earned gift to yourself. Each of the three candles included in the set represents a striking combination of scents that can completely change the ‘feel’ of any room. 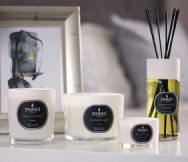 Every Parks ‘Tot’ Candle is poured into a fine glass votive mini vase by hand, around one of our unique smokeless cotton wicks. Each will burn for as long as eight hours, and need not typically be trimmed either between uses or in use. The Wild Fig, Cassis and Orange Blossom tot set is one of our most popular. Wild fig is uniquely sweet and fruity, but with a piquant note. It can be mistaken for mint, but betrays this with a richer, earthier overall tone more similar to jasmine. It is widely considered to be a calming fragrance. Cassis (blackcurrant) blends in easily, adding a sense of youthful exuberance and speaks of harmony and balance. Orange blossom combines with the fig and cassis tones to add spice to the mix, adding beautiful balance to the overall effect. The sprightly scent is reminiscent of Mediterranean foliage and lazy Sunday afternoons in the sun. These tiny candles are all hand crafted and formulated to hold their scent for years, so they will remain as fresh as the day they were poured, ready when you are. The Parks Wild Fig, Cassis and Orange Blossom 3 Tots Gift Set ships in a presentation-quality gift box.